In a medium sized mixing bowl, beat together the eggs, buttermilk, melted butter and vanilla. In another bowl, whisk together the dry ingredients; combine the wet and dry ingredients just until smooth. 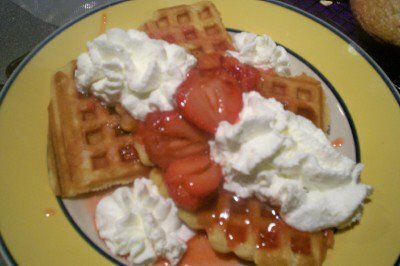 Spray the waffle iron with a nonstick cooking spray before preheating it. For an 8-inch round waffle, use about 1/3 cup batter. Cook for 2 to 3 minutes, or until the iron stops steaming.